In one respect, JAWS 4: THE REVENGE, is trying to emulate the dark 1977 movie ORCA, about a killer whale seeking revenge for its murdered family. (Ironic, considering ORCA was summarily dismissed as a ripoff of the original JAWS, which it wasn’t.) In another respect, JAWS 4 is simply batshit. Taking it as read that a fish can harbor the concept of revenge, we hafta ask: Revenge on whom or what? 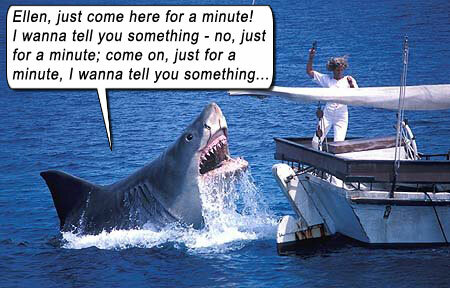 How does this shark (nicknamed “Vengeance” by fans) even know Ellen Brody (the wife of Martin Brody from Amity Island)? In JAWS, Bruce the shark was exploded near Amity, without – so far as we know – communicating the identity of his murderer (Martin) to the undersea kingdom. And when Brucette was electrocuted in JAWS 2 (also by Martin), ditto. Ellen was nowhere near the sharks in both these films. In JAWS 3, Brucetta exploded, never conveying to her offspring or to the shark community Ellen’s identity – Ellen did not even appear in the film. As far as we know, none of these sharks even got a glance at Ellen, nor are any of them psychic. As far as we know. 4) how to track Ellen to the Bahamas, a tropical locale where sharks can’t even survive! Vengeance doesn’t even follow Ellen’s trail across the water – she takes a plane there, so either he’s sniffing the air for her trail of pheromones, or he’s got a network of shark spies with frickin’ laser beams attached to their heads. I think the latter. Ellen’s older son Michael (Lance Guest) spirits Ellen away from Amity to spend Christmas with him, his wife (Karen Young) and five-year-old daughter in the Bahamas, tropical waters where Ellen’s fear of sharks is unfounded as sharks never lurk there. But of course, with his spy network of sharks with frickin’ laser beams attached to their heads (you think I’m joking? 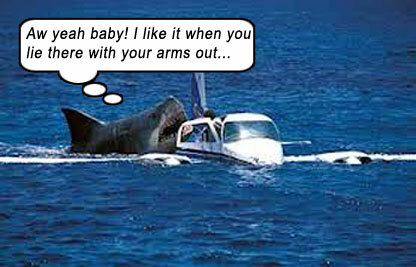 How else can a great white follow a human in a plane into inhospitable territory?) Vengeance follows. Of course, Michael’s job involves diving, with a bad-Jamaican-accented Mario Van Peebles. Shark encounters ensue, with a reasonably authentic rubber shark (that sometimes “crinkles” when it opens its mouth), that has somehow learned Michael is Ellen’s son, so attempts to make him brunch. Ellen finds herself pursued by two sharks – one of them rubber, the other wanting to use a rubber – Michael Caine as island pilot Hoagie, an old sea dog always ready with a tall tale and an accommodating shoulder. And maybe a rubber. Movie tries hard to recall JAWS: some of John Williams’ themes; recreating that poignant scene in JAWS where the little kid imitates his father at the dinner table (Ellen sees this and has flashbacks like she was in ‘Nam). After Vengeance attacks the beach where her granddaughter is playing, Ellen takes the boat out to sacrifice herself to the shark. Or maybe to kill it – I couldn’t tell from her hackneyed facial expression. Her fanatic death wish is thwarted by son Michael and the faux-Jamaican, with Hoagie’s plane being eaten, before the worst staging of a climactic shark death scene in cinema, as Vengeance is shocked repeatedly out of the water by a beacon that he swallowed, eventually being impaled on the bowsprit during one of his leaps. It’s ridiculous, hilarious and very, very rubber. This climactic encounter between the heroine and the villain is anti-climactic mainly because the movie succumbs to the convention that a woman cannot be the hero in an action movie of this ilk. It’s still 1954 in this movie. Three men do all the work to setup the shark death – they even show cutaways of Roy Scheider’s last scene with Bruce to add to the male presence; all Ellen does is steer, with a look on her face like her turkey is burning. aka: JAWS 4: THE REVENGE. Writers: Peter Benchley, Michael De Guzman. Starring: Lorraine Gary, Lance Guest, Mario Van Peebles, Karen Young, Michael Caine, Judith Barsi, Mitchell Anderson, Lynn Whitfield, Melvin Van Peebles.